Thanks to technological breakthroughs by Syndicate R&D, many of the Buildings in your Base can now be upgraded even further, and select upgrade Levels now grant Special Bonuses! You can explore these types of building Bonuses by viewing the "Bonus" section in the Info tab of your Buildings. - Upgrade the Tracking Center to a new Level in order to hold additional Equipment Depots and Repositories! As of now, the Tracking Center influences the number of Depots you can hold as well as the number of Repositories. - Upgrade Air Traffic Control to new Levels and grow your Ration stockpiles! Plus, get a Special Bonus at Level 21: you will be able to revive a greater percentage of your fallen Troops at the Field Hospital. - Upgrade the Joint Ops Center further to be able to have more Allies! - Upgrade the Contracting Office to new Levels to further increase Contract Negotiation speed, plus get a Special Bonus at Level 22: a permanent increase to the amount of Experience you gain in combat! - Upgrade the Bunker to new Levels to further increase its Resource holding capacity, plus get Special Bonuses beyond Level 22: some of your Troops will be automatically Bunkered as soon as they are trained! No extra Level has been added to the Commandant’s Office. Remember, having a Level 22 Commandant’s Office will grant Commanders a Special Bonus: a permanent increase to the amount of Experience gained in battle! If you haven’t upgraded your Commandant’s Office yet, you can still do so! 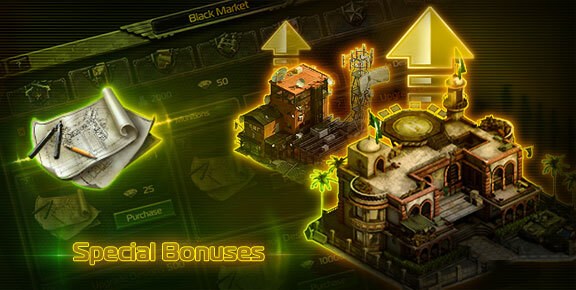 Use Upgrade Designs to reach these new building Levels and unlock the Special Bonuses. You can get Upgrade Designs from the Black Market, or earn them as part of select in-game Events – like certain Tournaments. Don’t let your Combat Engineers sit idle!